Unlike when you are getting the embed code for a single address or a folder of addresses, you get the opportunity to customize the appearance of your address book once it’s embedded so that it matches the rest of your website. You can change the color of almost every element in your Address Book and you can also choose what functions do or do not show up in the embedded Address Book. For example, you can choose not to have the search or print options. 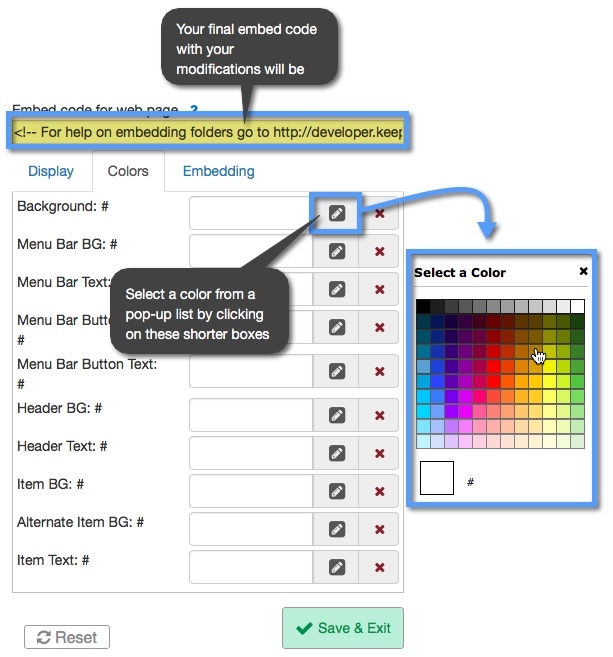 On the left side of the embed screen are your options for adjusting color and viewing options. 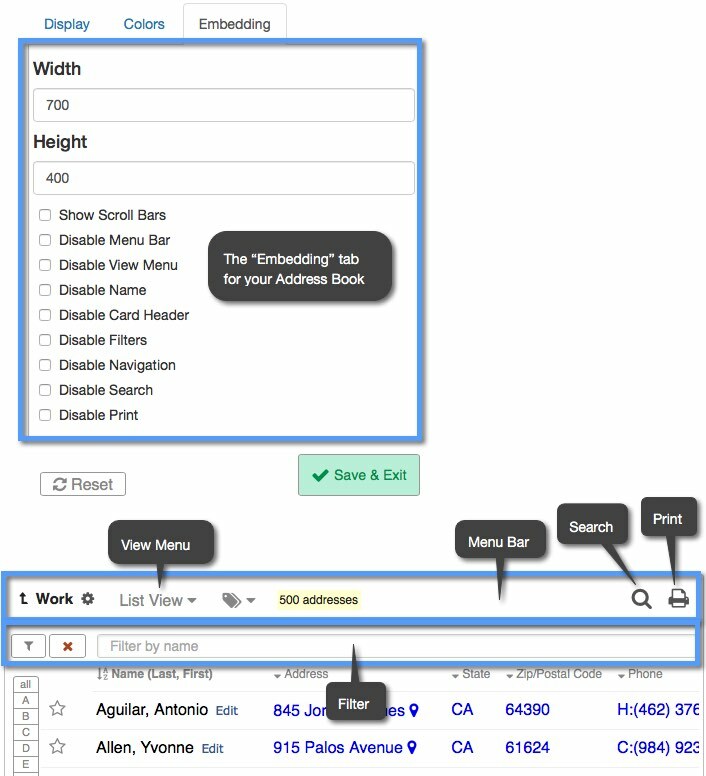 The bar below shows your display options for Address Book functions such as search and print. On the right hand side of the screen is a preview of what your embedded Address Book will look like after making any customizations. As you will see in the sample code above the “mbc” shows where the code for the Menu Bar BG is and the “40A0FF” represents the color that the Menu Bar BG is. At the bottom of this screen is a “Reset” button that you can click to clear any customizations you have made to your Address Book. By clicking the check boxes next to the items listed in the bottom panel of the embed Address Book screen, you can choose to show or not show certain functions in your Address Book. In the bottom panel the “Name” option will show the name of your Address Book on the final embedded code. 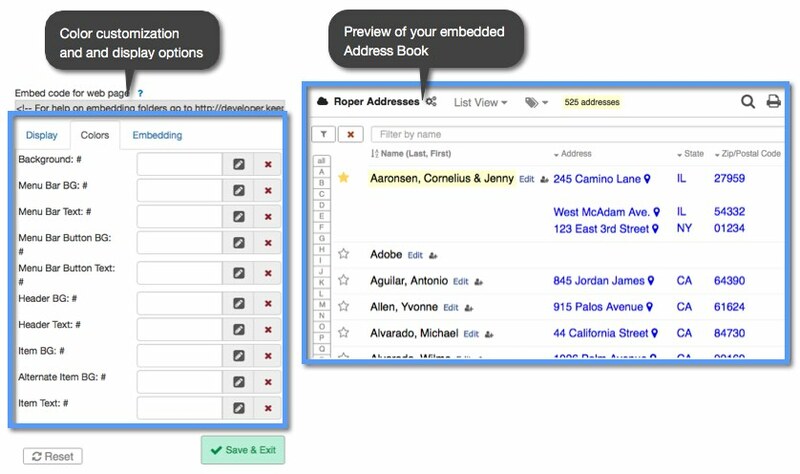 If you want to change what types of information show up in your embedded Address Book (Notes, names, phone numbers, etc.) you will need to first customize your Address Book display.